building an inclusive community to ensure that people with disability enjoy the same right to live their lives as they choose, and enjoy the same opportunities and benefits of living and working in the Shoalhaven. The plan has been developed in consultation with people with disability, their supporters and services, and provides a four-year framework for improving access and inclusion across the Shoalhaven Local Government Area and to Council services. Alternatively, you may request a paper copy of the Plan from Council's Administration Centre reception. You can also phone Community Development and have a Plan mailed to you - phone (02) 44 293 411. Need help understanding the Plan? Staff members are available to support people to go through the plan. To request this service, please contact Melissa Andrews, Community Development Officer, phone (02) 4429 0011 or email council@shoalhaven.nsw.gov.au. Do you want to make your business more accessible? Would you like your employees to gain more of an understanding on how to work with people living with disability? Council is hosting a Disability Awareness Business Workshop in Ulladulla and Nowra. The workshop will be facilitated by Sean Willenberg from NSW Business Chamber and aims to support employees gain a better understanding of what disability means. Wednesday, 20 September, 5.00pm – 7.30pm at Ulladulla Civic Centre, 81b Princes Highway, Ulladulla. Look at myths and misconceptions surrounding disability and people living with disability. Recognise how these misconceptions translate into everyday language and what respectful communication involves. Enable participants to familiarise themselves with possible situations they may encounter with people with disability specific to their workplace. Build capacity of participants to engage and deal respectfully with people living with disability. RSVP essential: Contact - council@shoalhaven.nsw.gov.au or phone 4429 3456. Do you want to increase access to your business in the Nowra CBD? 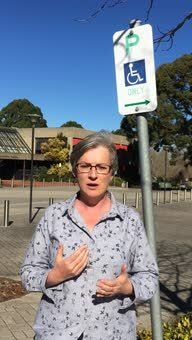 Make it easier for people living with disability, seniors with limited mobility and parents with prams access your premises. Council is offering Nowra CBD shop owners the opportunity to receive financial assistance of up to $3,000 to upgrade your shop accessibility. Note: Applicants must make a financial contribution of 50% of the total cost of the upgrade. The Nowra CBD Access Improvement Program is part of the overall Nowra CBD Revitalisation Strategy. The aim of the program is to encourage building and business owners to improve physical access to their place of business through financial assistance. Improving access benefits everyone by enabling every individual in all walks of life to access shops, cafés, restaurants and other businesses equitably. Improving access will encourage people with disability, older people and parents with prams to be able to contribute the CBD’s economy and be included in the CBD’s social and cultural environment. The guidelines recognise the program area as highly utilised for pedestrian movement and allows building owners and business operators to apply to receive financial assistance for labour and materials to improve physical access to their business.